"Your Wedding - Your Way"
Our Chapel has a beautiful Wedding Arbor. 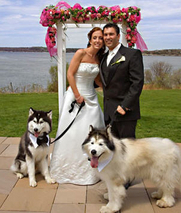 Brides can borrow one of our Wedding Bouquets to make their wedding photos special. Each of our couples receive a beautiful Certificate of Marriage. 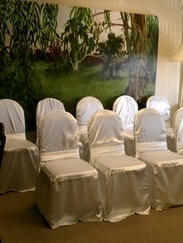 The Chapel has seating for up to 10 guests. We can schedule the perfect time for your wedding, or make that last minute wedding or a special place to elope, a reality. If you need help with the marriage licence process, just give us a call. We are here to help you make your Wedding Day as special as possible. Podium and Very Special Ceremony & Vows. Custom Ceremony & Vows available upon request. Jo Souza, will travel to your location. Finding the perfect Wedding Officiant for your wedding is one of the most important parts of the wedding plan. Jo Souza has specialized speaking skills that help her to make every wedding unique, special, and memorable. Her background as a public speaker, author and counselor provide Jo with the skills needed to assist each couple with creating a beautiful Wedding Day. You can have your wedding at our Chapel, or at a location of your choice. We have made it possible for anyone to have a beautiful and affordable wedding ceremony. As a wedding and marriage Minister, it is Jo's goal to assure quality service at an affordable price. Ordained by: American Marriage Ministries. Ordination Credential and Letter of Good Standing posted in the office and available upon request.